Joseph Mary Plunkett was born in No. 26 Upper Fitzwilliam St. on November 21st, 1887. His grandfathers were builders and developers in South Dublin in the late 19th century creating comsiderable wealth. This wealth was united in the marriage of Joe’s parents, Josephine Mary Cranny and George Noble, Count Plunkett who was a Papal Count, and Joe was the second of their seven children. He contracted Bovine Tuberculosis when he was about two. He was educated in CUS (Catholic University Schools) Leeson St., a Marist School in Passy near Paris and Belvedere College but in all cases his attendance was very sporadic because of his frequent illness. He also attended the Philosophers’ Class in Stonyhurst Jesuit College in Lancashire from age eighteen and from that time read constantly and was writing creatively. mostly poetry. He failed the Matriculation exam for UCD partly because of his lack of fomal education. Through his desire to learn Irish he met Thomas MacDonagh who became a very close friend and co-conspirator both in literature and politics. In 1911 Joe spent several months travelling in Malta, Sicily and Italy and later in the year he moved to Algiers for his health for six months during which time MacDonagh saw The Circle and the Sword, Joe’s collection of poems, through the press. In 1912 he moved to Marlborough Rd. Donnybrook with his sister, Geraldine and at intervals they also lived in Larkfield in Kimmage, a house with land belonging to the family. Joe became editor of The Irish Review and with MacDonagh and Edward Martyn started the Irish Theatre. He was joint secretary of the Peace Committee for the 1913 Lockout and joined the Volunteers when they started at the end of that year becoming involved at committee level straight away. He was invited into the IRB and subsequently on to the Military Council and devised the military plan for the Rising. On behalf of the Military Council he travelled through war-torn Europe to Germany to negotiate arms from the German Gvernment after the ground had been prepared by Roger Casement and he wrote the consequent agreement between the German Government and the Military Council. Larkfield had become a training camp for the Irish from England avoiding conscription and it was here that Michael Collins came in November 1915 to look after the Plunkett family accounts. Collins was Joe’s ADC from early 1916. In September, 1915 he went to New York to see John Devoy and Joe McGarrity to inform them on the German Government agreement and arrangements for guns for the Rising. On his return he helped Grace Gifford with her preparation to become a Catholic and they got engaged in December 1915. Joe had an operation on his cheek three weeks before the Rising and supervised the printing and publication of the Castle Document from his nursing home bed and he organised radio transmissions to get the news of the Rising to the world. He also sent his father, Count Plunkett, to Rome to inform the Pope of the Rising plans. He was the youngest signatory of the Proclamation of the Irish Republic. In the GPO for Easter Week he collated military information and left there for Moore St as the GPO was being consumed by flames with Pearse, Connolly, Clarke, Mac Diarmada, his brothers, George and Jack, and a couple of hundred men. From Moore St. Joe and Willie Pearse led the men as they marched to surrender at Parnell Square. Joe and Grace were married in Kilmainham Jail hours before he was shot but they were given no privacy and only ten minutes to speak to each other in a cell full of soldiers. His father, mother and two brothers were all arrested and sentenced after the Rising. 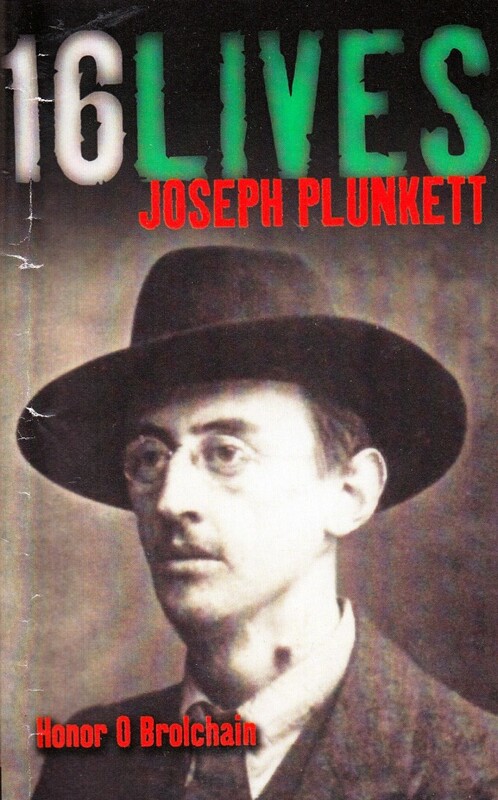 Joseph Plunkett was already dying of TB when he was shot in Kilmainham on May 4th, 1916.